Tijuana has had a few really rough years. Between the swine flu, the drug war and the US debt meltdown, it has been one catastrophic blow after another. The end of the downturn is now upon us and many local users are capitalizing on the low rents and prices available to acquire high quality facilities at some of the lowest prices we have ever seen. 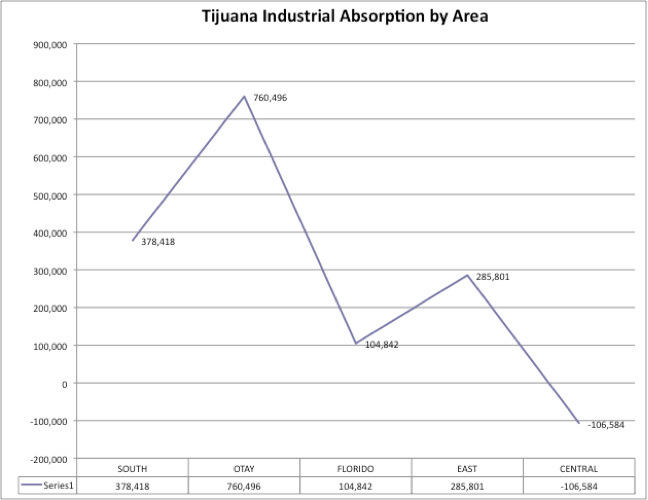 The approximately 53 Million SF Tijuana industrial real estate market experienced positive net absorption of about 1.4 million SF in 2010. This is primarily considering the Tijuana industrial real estate sector, and excludes apartments and hospitality. As illustrated above, net absorption was concentrated in the class A Buildings. This due primarily to existing Maquilas migrating to newer facilities that were available at lower cost than their existing rents. Many companies have remained in their current building, but have renegotiated their lease to better reflect current market conditions. Geographically, the tendency was for negative absorption in the older central markets and the highest absorption in Otay and the Southern Markets including Pacifico Industrial Park. 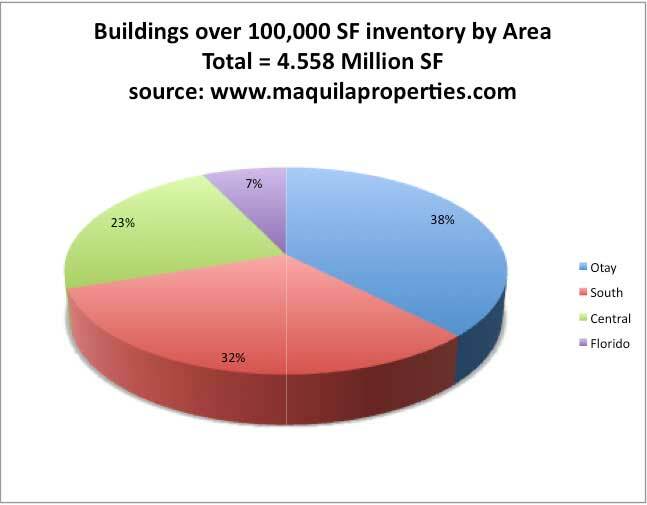 538,742 Square Feet (SF) of the Otay absorption came from the Prime Wheel purchase of the former Douglas Furniture campus, which was in a state of disrepair when sold. This represented a low point for the market with a price of $13/SF of building, occurring at the beginning of the year. The building needed refurbishing, but the buyers acquired a property for less than the original cost of the unimproved land. The next largest transaction was the purchase of the 288,000 SF former JVC plant at La Frontera for approx. $10.5 million by Energy Labs, a Maquila Properties, Inc. client. This $36/SF price reflected major improvement in the market. JVC was a much newer and well maintained facility with better infrastructure, including a 69,000 V. electric cost-efficient substation as well as an excess 13 acres of land for future expansion. Energy Labs is a long time Tijuana Manufacturer of air handling and HVAC systems for large offices, hotels and hospitals and has been steadily growing in Tijuana. New companies to the market were in metal fabrication (Prime Wheel), medical (Ossur from Iceland) and foam packaging industries (Samil Foam from Korea). 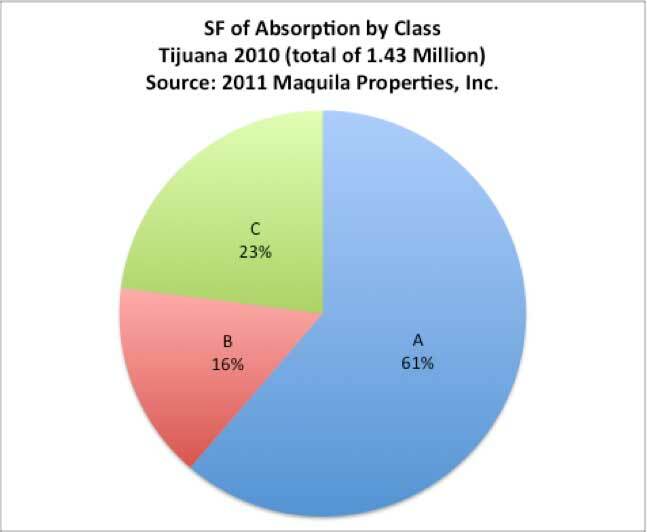 However, the majority of the absorption was from expansions of existing Maquilas. Of the 34 new leases or user purchases over 50,000 SF only 4 were new to Tijuana. The biggest negative absorption (that is, buildings being dis-occupied) came from the continued Japanese electronics exodus from Tijuana. Hitachi left its 429,763 SF TV manufacturing plant in Otay’s Seccion Dorada. Sony dis-occupied a 319,000 SF distribution facility in Alamar and both Hitachi Transport and Pioneer vacated a pair of 300,000 SF manufacturing plants. New construction: There were some 300,000 SF (0.5%) of new construction started by Mexican firms in 2010: OXXO (Mexican retailer) built a 163,000 SF distribution building at its new Blvd. 2000 industrial park. Celulosa de Sonora (Mexican corrugated box manufacturer) started a 120,000 SF built-to-suit for lease from local developer Grupo T&G for a purported $0.32/SF NNN in the Los Olivos, central area. Current inventory: Maquila Properties inventory of industrial buildings in Tijuana over 10,000 SF consists of 167 Buildings totaling 8.9 million SF with an average size of 53,000 SF. The largest in the market is the 429,000 SF Hitachi TV building in Ciudad Industrial. Industrial vacancy is 17%. But with the low construction starts, obsolete inventory being repositioned as retail, and net absorption of about 2.5% last year this number is expected to drop over the next few years to a more balanced vacancy – the “buyers” market will soon be over. There are 25 buildings over 100,000 SF available with an average size of 178,000 SF so there will be little speculative industrial construction in Tijuana. However certain markets like El Florido have very little vacancy. Some SAMSUNG suppliers, like INZI and Samil Foam, are being forced to move close to El Florido. INZI plans to build a 200,000 SF facility in El Florido. Other construction includes Kyocera Solar’s expansion and installation of solar panels on its Tijuana plant. 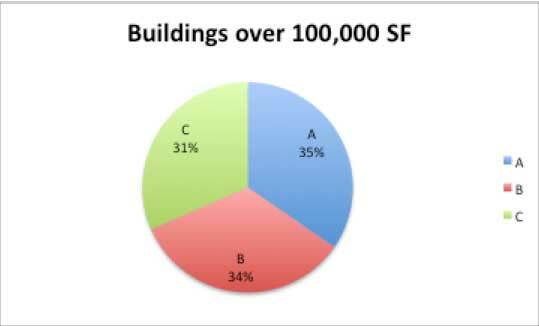 As you can see below, about 1/3 of the available buildings were Class A. Forecast: Manufacturing in the US is starting to recover and that is the strongest determinant of Mexican maquila industry growth. As you can see from the US Federal Reserve industrial production chart below, production is rising rapidly from its 2008 lows. 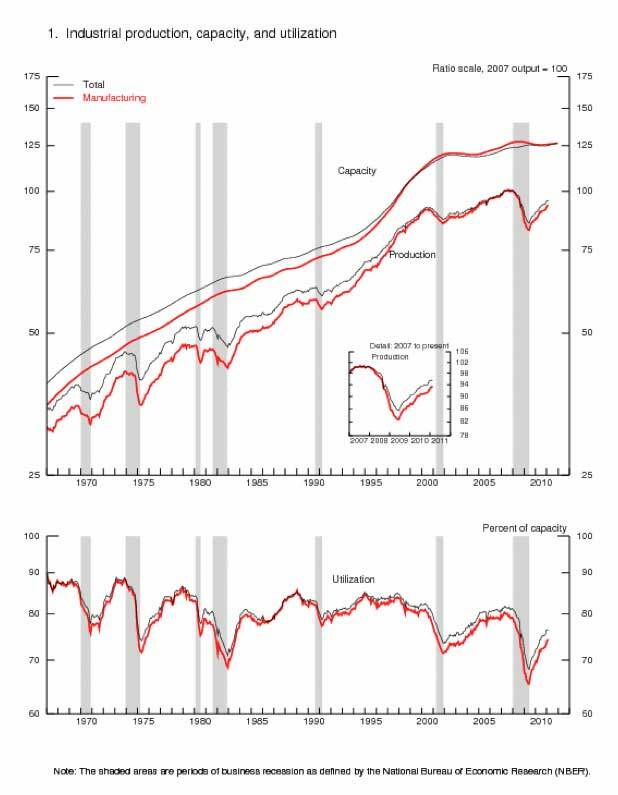 Factories in the US have gone from about 65% capacity utilization in 2008 to about 75% in 2010. As this metric begins to reach the 80% mark, Tijuana typically sees a spike in demand. Manufacturing costs have dropped, in spite of the high valuation of the peso – rents are lower and skilled workers are readily available. Tijuana unemployment has increased by more than double from 2007. Employee turnover, which was as high as 10% per month in 2000, has dropped to less than 2% as the headcount employed by Maquilas has dropped from over 200,000 to less than 150,000 today. (Source: Ruiz Morales Survey as presented to WMTA). The Obama administration has finally approved a plan, part of NAFTA, to allow Mexican owned and operated semi-trucks, which meet US standards, to cross into the US in spite of Teamster protests. This will increase efficiency at the border and increase the competitiveness of the Maquila Industry, which has only had access to the immediate border zone for its Mexican truckers. Another possible issue that might increase the rents is the consolidation of Prologis and AMB, which will increase the concentration of ownership and increase the power of AMB in negotiations. This deal is still seeking regulatory approval but will create an entity that controls about 4 million SF in Tijuana. Another factor which will improve the Mexican manufacturing market is the rise in value of the Chinese RMB. In spite of the “Super Peso” (as of 3/2011 at 11.5 pesos to the dollar) valuation, relative competitive advantages due to better market responsiveness and soon, lower costs from the implementation of the NAFTA trucking rules, will create an inflection point where Mexico once again becomes the outsourcing choice of many manufacturers. Chinese costs are coming up, and coupled with higher transport costs and time lags at US ports, will reduce the landed cost advantages from Asian production. The recent Tsunami will force manufacturers to reconsider their Asia-centric manufacturing plans and diversify the supply chain closer to final markets in North America as well. A Hong Kong businessman with 1600 employees in China believes within the next few years, Mexican production will be more cost competitive versus Asia for his plastics products bound for North American markets. Streamlining the supply chain and faster customer responsiveness will more than make up for the lower labor costs in Asia. We expect that many other manufacturers in China will follow accelerating the anticipated growth. Maquila Properties, Inc. expects to see 3% net absorption in the market in 2011 as new solar and aeronautics facilities continue to expand in Tijuana. The buyer/tenant market will continue to put downward pressure on lease rates and asking prices, averaging $0.43/SF NNN for class A space in 2010. Actual leases rates in 2010 averaged $0.36/SF NNN for well-located Class A space. Class B space rented for about $0.29/SF NNN. Some deals were closed in the $0.25/SF like the former Finegood furniture facility. Much of our business has been concentrated on low cost purchases by existing companies as well as lease renegotiations of the “blend and extend” type and we expect to see a continuation of this. The rates should begin to climb into the 2013 time frame, when we expect vacancies to reach 12%. After that, expect new construction to begin again.